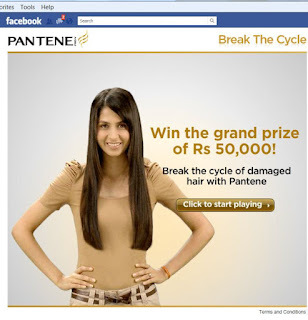 Pantene India, since the last year, has been very active on digital. They now have a great social media mix in their marketing portfolio and they are working it well too. Not something we see a lot with beauty brands in India. I am not sure why, though. At the last Comscore count there are 17million women on the web in India. Coming back to what Pantene is doing on Facebook. The brand has an active wall with frequent posts around beauty tips, new looks, hair accessories etc, Polls and Discussions, which induce interactivity. They also have photos and a Twitter and Youtube plug with celeb endorser videos and TVCs. Two specific points of interest on the page are the Star Secrets Unveiled and Break the Cycle application. Break The Cycle Application is a (chroma video) game where the idea is to get the model to avoid obstacles and collect Pantene Pro V Capsule points. It is a nice execution and a great way to drive engagement on the brand page around their new campaign premise. Haven’t seen many Chroma Video usage examples in games in India and I can tell you it requires great effort in storyboarding and shooting. It is a multi-level game so I assume it does keep the engagement going – the gratification being Rs.50,000 in prize money! I didn’t last more than a level though! Players can Publish and Tweet their score or challenge a friend via Facebook. The Star Secrets Unveiled section is a great way to let users understand more about the products and what works best for their hair issues – users can click on a Pantene endorser image to view their hair secret and also select their hair problems and check out the related Pantene product.